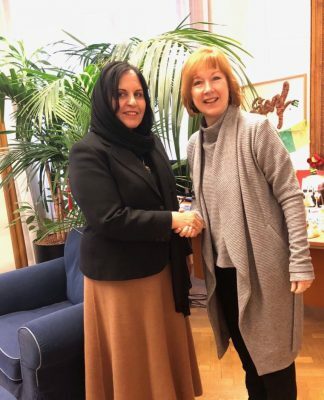 Today, Ambassador Khojesta Fana Ebrahimkhel met with Dr. Margareta Griessler-Hermann, International Advisor and deputy to Mayor of Vienna to discuss Afghan migrants living in Vienna and to establish a twinning of Austrian and Afghan cities. 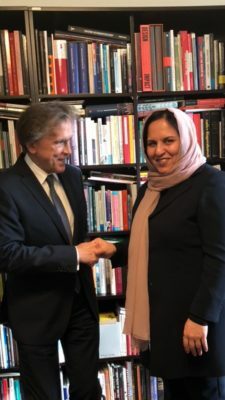 Ambassador Ebrahimkhel also expressed her desire to establish new areas of bilateral cooperation in businesses, culture and education and wished to connect one of Afghanistan’s big cities, Herat, Kabul or Jalalabad, with Vienna. One of the main priorities of the strategic plan of the Embassy and the Permanent Mission of Afghanistan in Vienna is women empowerment. 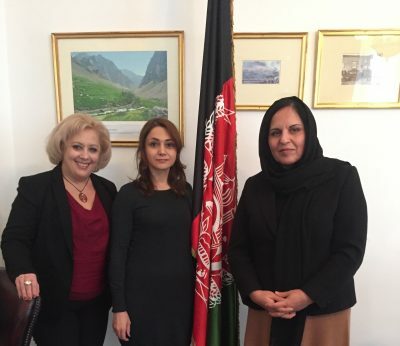 In line with this priority, Ambassador Khojesta Fana Ebrahimkhel met with Dr. Ourania Roditi and Dr. Behnaz Hosseini to discuss and assess the frequency and popularity of ‘temporary’ marriages in Iran, Iraq and Afghanistan and among the corresponding refugee communities in Austria. 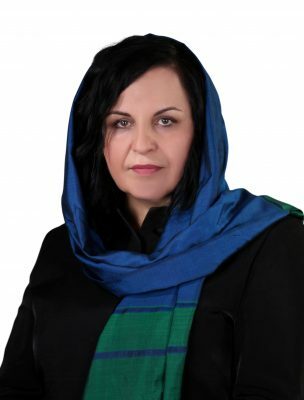 Ambassador Ebrahimkhel had a leading role in the creation of Afghanistan’s National Action Plan on Women, Peace and Security (NAP 1325) and has also established the Association of Afghan Women Diplomats. 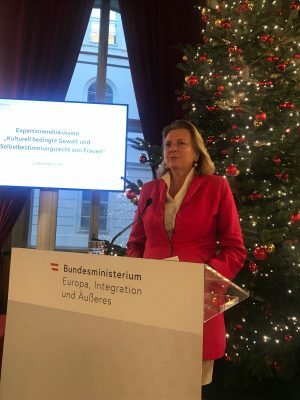 Ambassador Ebrahimkhel expressed her will to support and participate to a day-long ACUNS conference on ‘Challenges and the tradition of temporary marriages in the Middle East’ that will take place in March 2019. Based on the strategic plan of the embassy and the permanent mission of Afghanistan in Vienna, and in order to establish a new platform of Austrian health cooperation with Afghanistan, Ambassador Khojesta Fana Ebrahimkhel, following a series of meetings with Afghan doctors in Austria met with Dr. Abdul Razeq Malyar, an Afghan Medical Doctor in Vienna. In this meeting, Dr. Malyar expressed his concerns on the increase of breast cancer among women in Afghanistan and said that “the Government of Austria has the capability to provide hospitals with high-tech equipment and to train doctors in the prevention and treatment of patients in the preliminary and developed stages of breast cancer. Ambassador Ebrahimkhel thanked Dr. Malyar for his timely observation and promised to discuss this issue with the relevant authorities in the Government of Austria. 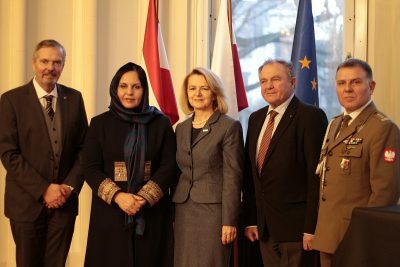 On Wednesday, 5 December 2018 Ambassador Khojesta Fana Ebrahimkhel participated in the Award Ceremony of the Star of Afghanistan at the Embassy of Poland in Vienna. Ambassador Ebrahimkhel warmly congratulated the four awarded officers with the Star of Afghanistan for their excellent service in Afghanistan. The Government of Afghanistan will always remember the soldiers who were killed in action and will always be eternally grateful for their sacrifice. During her statement, Ambassador Ebrahimkhel expressed the appreciation for the international community’s support in Afghanistan. Ambassador Ebrahimkhel thanked NATO and all international partners for their sacrifices and for their commitment to train, advice and assist the Afghan National Security Forces (ANSF), which remains essential for a better future for the Afghan people. Lastly, she reassured the international community that Afghanistan will seek to use its strategic location as an opportunity for trade, transit and connectivity in our region and not as a land of war and terrorism. On Tuesday 4 December 2018, Ambassador Khojesta Fana Ebrahimkhel met with Dr. Martin Ledolter, Managing Director of the Austrian Development Agency (ADA), the operational unit of the Austrian Development Cooperation. 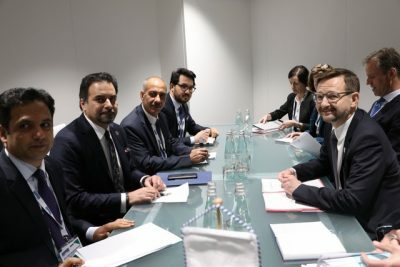 They had detailed discussions on issues of mutual interest, including the issue of refugees in Austria and the elections planned to take place in April 2019 in Afghanistan. During the meeting, Ambassador Ebrahimkhel stressed that Afghanistan should not be perceived in a development context only, but should be recognized also in terms of holding significant economic, trade and investment opportunities. Afghanistan’s abundant natural resources, nascent trade agreements, and burgeoning networks of transport and energy represent the great economic promise of a more integrated South and Central Asia. It is noteworthy that this is not a novel idea but rather a restoration of Afghanistan to its historical commercial and cultural role as a vital land-bridge at the heart of Asia. Today, Ambassador Khojesta Fana Ebrahimkhel met with Dr. Emil Brix, the current Director of the Diplomatic Academy in Vienna. They had detailed discussions on issues of mutual interest, including the peace process and the challenges and the achievements of the past several years in Afghanistan. 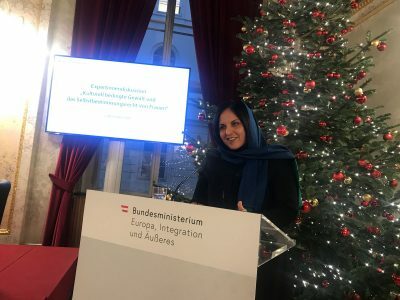 Ambassador Ebrahimkhel thanked the Diplomatic Academy for the courses offered to junior Afghan diplomats in the past and expressed interest in securing additional scholarships and fellowships for Afghan students in Austria. Ambassador Ebrahimkhel and Ambassador Brix also discussed in depth new areas of cooperation, particularly the interest in the participation of young Afghan women in diplomatic training.